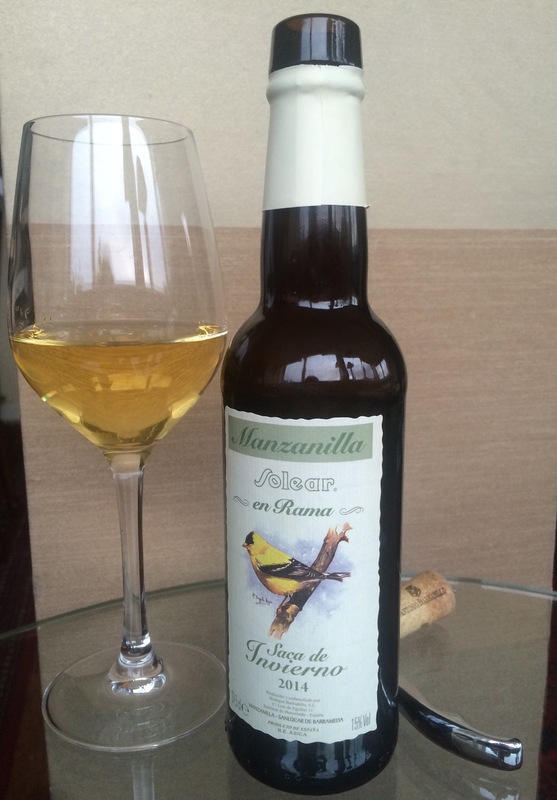 It is wintry weather outside so what could be better than this winter edition manzanilla en rama from Barbadillo. Saca literally means “taking out”, as in when the wine was taken from the solera and bottled (and is incidentally the origin of the old english word “sack” for sherry – do not buy the stuff that comes in sack cloth in the airport). Barbadillo produce a saca for each season – each with an attractive feathered friend on the label – this one being winter 2014. Just look at the beautiful deep gold colour of this. It is around 8 years under flor and looks to have grown in character. In the nose it has loads of yeasty unbaked bread and more dried herbs than fruit, maybe a bit of citrus in the background but not much by the way of the grapey apple of the mosto. In the mouth it is big and velvety, has an almost oily mouthfeel, and in flavour terms it is dry and intensely herby – again maybe a bit of grapefruity citrus. Not too salty – to be honest almost seems like a sherry rather than a manzanilla. It is immensely long. All in all a superb thing to have to hand for a pre dinner snifter. And again, 10 euros for a (half) bottle.